Wait, . . . that’s not how a blog post is supposed to start. I’ll admit, breaking the “rules” of writing has kind of become a habit of mine. I used to be a rule-follower – and nonfiction writers have so many rules they can follow – but a few years ago something showed me those rules were hemming me in. Hemming me in as a writer and as a reader. I was always told to write for the reader I was as a child. But I can’t. You see, back then I didn’t know mind-blowing nonfiction existed. I followed the rules. I read the books I was supposed to read. Good books like Anne of Green Gables, My Side of the Mountain, and Island of the Blue Dolphins. Books that sucked me right into the world of fiction. If I checked a book out of the library, I read every word and returned it on time. I knew it would be torture to slog through one of those dense nonfiction books so I never checked them out. And here’s another little confession: As an adult I’d been writing nonfiction for kids for 10 years, yet I still didn’t read nonfiction for pleasure. I was still hemming myself in with those rules. Then one day someone convinced me to read some nonfiction by Mary Roach. Holy cow! Stiff: The Curious Lives of Human Cadavers blew my mind. You can read nonfiction like that? You can write nonfiction like THAT? In her story of inquiry Mary Roach asks: If I donate my body to science when I die, what happens to it? Suddenly I just had to know the answer. Fortunately she lets us tag along while she chases her curiosity. How had I missed nonfiction like that? I became a reading rebel. When I was a teacher, an eleven-year-old boy came back from the library defeated. This outdoorsy kid said, “Miss Heather, I can’t find anything I want to read.” Since then, I’ve wanted to write something for that kid. After reading Mary Roach I knew he’d love her work, but only if he kept reading. That kid needed a gateway to adult pop science. That’s when I became a writing rebel. I had to throw out the boring and get to the good stuff. Forget that kids aren’t supposed to read tragic material. Forget that a book is either narrative or expository. Forget that science books are supposedly unbiased. So I plunged in – up to my elbows sometimes – into a topic that gripped me: roadkill. Every day, creatures lose their lives on our highways. What, I wondered, can we learn from them? And soon I was discovering other rebels. The New York Department of Transportation asked: Why not use those bodies for compost? A scientist asked: What’s that lump on the Tasmanian devil’s snout? (Turns out it was contagious cancer. Yes, contagious. Scary!) A group of kids asked: Why can’t we string rope bridges above roads so monkeys can swing across safely? Boom! Mind blown. Tragedy turned into terrific. I started spending entire workdays marveling at the insides of dead animals. I’d miss meetings because there were too many bodies that needed hauling off the interstate. This “Teacher’s Pet” was missing deadlines because she was slicing open road-killed snakes. I spent lunch hours squatting by a decomposing coyote. I didn’t mean to become a rebel but there was something about this rule-breaking that made my nerdy brain jump for joy. 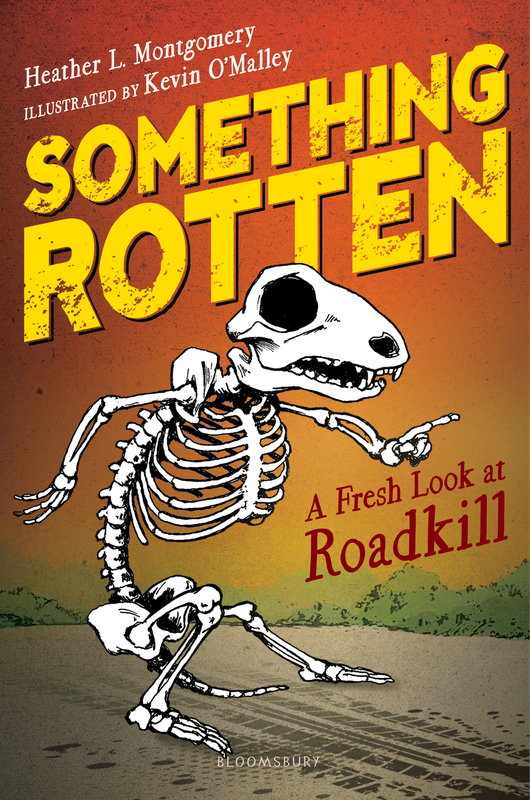 And that jumping for joy allowed me to write a kind of outrageous book: Something Rotten: A Fresh Look at Roadkill. Instead of writing for the 11-year-old me, I wrote for the kid who never knew true books could look into horrific, important, compelling topics that gripped my heart. I had to write a true book that was true to my nature. And to trust that the kids of today will look beyond the label put on a book. Who might even get busy writing their own true books – and do it their way. Heather L. Montgomery is the author of Something Rotten: A Fresh Look at Roadkill and Bugs Don’t Hug: Six-Legged Parents and Their Kids plus a dozen other nonfiction books for kids. Heather lives on the border of Alabama and Tennessee with her research companions: red RAV 4 and yellow dog Piper. They all agree that the discoveries have been worth every bit of roadkill stink and slop. Visit Heather at www.HeatherLMontgomery.com. Thank you so much for sharing Heather Montgomery’s work. I love her rebel heart. After reading your post and commenting here, I will be going to Amazon to buy her books to add to my classroom collection. For my boy-heavy class this year, I may have just found the key to unlock reading for a few of my striving readers.